Revealing mistake: When Frasier comes into the chalet after skiing he doesn't show any of the visible effects after a hard day on the slopes. Meaning, his face isn't even flushed from the cold, his hair is perfectly combed after wearing a hat and there is not even a drop of snow on his boots. Plot hole: At closing time, Cliff, Norm and Woody spontaneously decide to go to Cliff's house. Sam then enters the bar after his date at Melville's. Later in the scene, Rebecca asks Sam about the 'Three Stooges', to which Sam sarcastically replies that they went to Cliff's house. But how could he possibly know that since he entered the scene after they had already left. Other mistake: Right after Sam tells Carla he will sleep with the next woman who walks through the door, in the background there is an "Extra" (blonde-haired woman seen in background between Sam and Carla) who starts to cross right then turns and crosses lefts then turns right and stops and looks confused as to where she is to cross. Obviously she was given directions of which way to cross and when, but forgot. Continuity mistake: During the scene when Sam and Diane are left alone in the cockpit, the position of the curtain behind them keeps changing. When Sam is speaking, the curtain is half open. When the camera angle switches to Diane, the curtain is closed. Continuity mistake: In the scene where Carla is sitting at a table in the bar, dressed as the new Madame LaCarla and is voicing her doubts about being the new Madame, you can see that Carla is only wearing ONE earring. (left one). In other scenes she is wearing both earrings. Continuity mistake: Just before they reveal the answers of Final Jeopardy, they take a wide shot, and Cliff's question (Who are 3 people who have never been in my kitchen) is already revealed. But when they take a tight shot and ask Cliff to reveal his question, it is covered up. Continuity mistake: Rebecca walks to the bar, busily writing her love-letter to Robin on a notepad. As she speaks with Sam, she tilts the notepad toward the camera. We can see it is blank. Continuity mistake: In the scene where Sam talks to Henri, we can see Sam wearing a wedding ring. 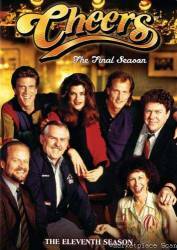 Of course, in the show, as a great lady's man, Sam is not married. (From 6:39 to 7:57). Visible crew/equipment: At the end, Sam gives up trying to get the phone number of the woman at the table. 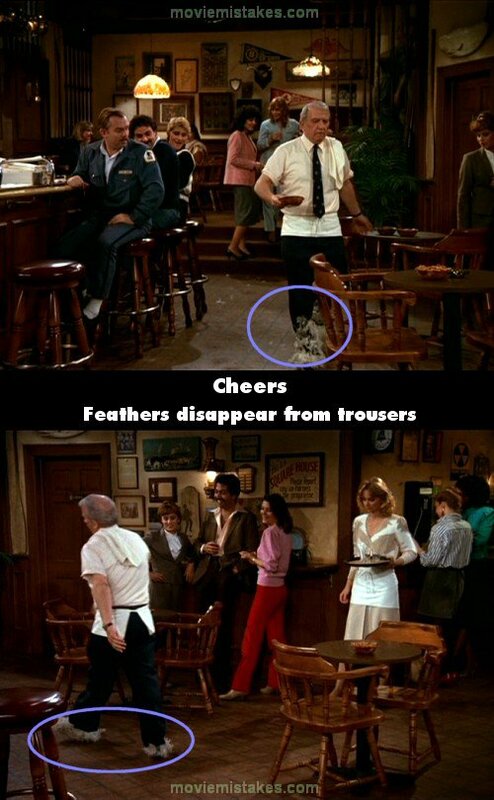 As Sam walks back to the bar, Cheers director James Burrows can be seen directing an off-screen camera. He is the bearded man wearing the green shirt. Continuity mistake: When Carla is talking about seeing Eddie and the restaurant there is someone at the bar who puts their drink down. The shot changes, the drink has disappeared from the bar, and the person puts it down again. Continuity mistake: After Sam and Robin are done playing darts, Sam puts his darts on the pool table. The shot changes and the darts have moved.